The Sammy Marks museum is just out of Pretoria on the road to Witbank. It was Sammy's residence at around the turn of the centuries, 19th to 20th. It is now a museum. GPS coordinates: 25.7501°S 28.3802°E elevation: 1319m. First a bit about Sammy Marks. Originally from Lithuania he came to South Africa as a young man of 24 with hardly a penny in his pocket and no education. Started in the Cape Town area as a peddler, later a trader and moved than to Kimberley, set up a trading store and became rich by getting involved into diamond mining. Later he expanded into coal mining at Vereeniging, steel production (Vaal steelworks in Vereeniging, still going), brick making (Vereeniging Brick and Tile), into Gold mining and many other endeavours. He was obviously too busy to think of women and marrying and only at the age of 40 did he get married to Bertha Guttman in England. 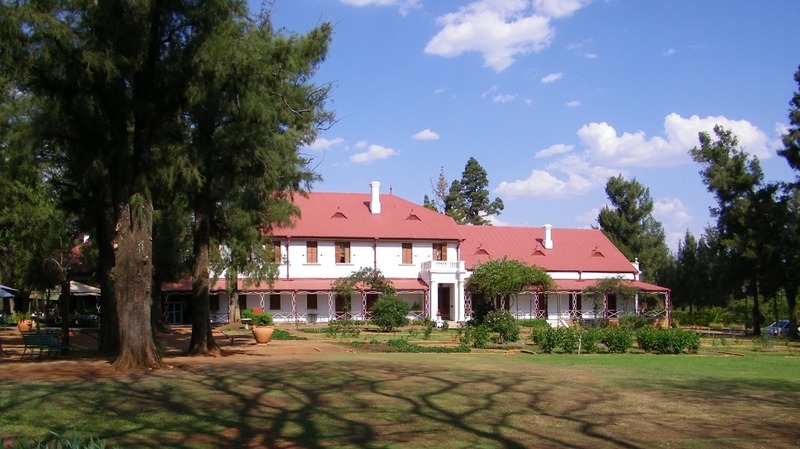 In 1885 he started building Zwartkoppies Hall, after a number of alterations it took the form as it is standing now. And that came about because he specified in his will that no changes can be made to the house for three generation after him. There you are, a beautiful and interesting place, kept in the way it was left by Sammy. The mansion with outbuildings and the ground around it is now under the custodianship of the National Cultural History Museum. Access is only by guided tours, this is for security reasons (they have lost some items), which is also the reason given for no photography inside. Thus there are no photos of the inside on this page, but there are plenty on Google. We, on our visit, had an enthusiastic and very knowledgeable guide (actually guidess, is there such a word?). It was a pleasure and very interesting following her around the mansion. My most interesting room was his office. Interesting was to see all the books on the shelf, he had nearly as many books as I do. For an uneducated man he had a very refined reading habit, what I could see was mostly non-fiction books. Would have loved to spend more time here. On a more personal note, many people will see him as a greedy capitalist only interested in making a profit. My view is that here was a man of incredible talent who pushed South Africa forward into the industrial age, in this process generating many jobs and overall making this a better place. I consider him a real hero of the country, we should celebrate his life rather than that of many politicians. In general politicians are a hindrance rather than a catalyst to economic growth for the betterment of all. There you have it, I had my speech and envy will get you nowhere. This is mainly directed at the communists and socialists, who I despise.